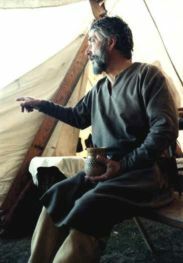 Slaves were an important part of early medieval society and appear in large numbers in charters and Doomsday Book, but the evidence for them is mostly fragmentary and widely scattered. Slavery was an institution of the Roman Empire, and picked by the Germanic tribes who dealt with it, as victims or suppliers. 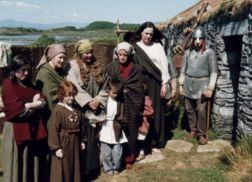 When those Germanic tribes reached Britain in the 5th century, they brought the practice with them, and the complete disappearance of Celtic culture from the east and south-east of Britain is strong evidence for their success. The chronicler Gildas was probably correct when he claimed that slavery was a common fate for many of his contemporaries, as the story of St. Patrick demonstrates. He was captured by pirates in the south-west of England, and spent six years in Ireland before escaping. Almost all the slaves traded in the early middle ages were captured in raids or warfare. It seems to have been the practice to kill the leaders of a losing army and enslave the humbler peasants and local villagers. The Vikings are the archetypal slavers in European history, enslaving victims in eastern Europe and the Mediterranean area, and selling them in markets far away. For example, a number of Moors taken during a raid in Spain in the 9th century ended up in Ireland, but Ireland itself was a source of slaves for the Vikings, as was Scotland. The Vikings, however, were not the only slavers. It can be shown that the English conquest of Cornwall in the 9th and 10th centuries led to the enslavement of many of the indigenous Celts. In the same period, Edward the Elder led a combined West Saxon and Meridian army against the Danes and brought back both slaves and livestock. So far, it seems as though people were only enslaved by foreign raiders, but this was not always the case. Earl Godwine enslaved some of companions of the Ætheling Alfred in 1036; Earl Harold took slaves when he landed in the West Country from Ireland in 1052; and supporters of Earl Morcar captured 'many hundreds of people' in Northamptonshire as late as 1065. We know where the slaves came from, but where did they go to? Where were the markets where people were bought and sold 'like brute beasts'? In England, one major 'export centre' was Bristol, little more than a village until the late 10th century. William of Malmesbury says that Bristol was a long-standing market: slaves were brought from all over England for eventual sale to Ireland. 'You might well groan to see then long rows of young men and maidens whose beauty and youth might move the pity of the savage, bound together with cords, and brought to market to be sold,' he wrote. Corbridge, in the north, was another market referred to in some documents. Apart from Ireland, many slaves were taken to Europe for sale. Rouen, in Normandy, was a major trading centre for goods seized by the Vikings - the Normans were known to have used domestic slaves- and it was a convenient location for pirates to off-load captives taken in raids along the English coastline. It seems that all the big markets were slave trading centres including, perhaps, Jorvik and London. Pity, really, it was a nice little earner.